03.18.08 | Love a good giveaway? The clean plate club is giving away a $50.00 gift card to Williams-Sonoma!!! Who wouldn’t love that? I drool over every single one of their catalogs. New utensils, new baking pans, a new casserole dish… Want in? Run over and enter. Happy St. Patrick’s Day, everyone! Hope you’re all wearin’ a bit o’ the green today. Well, this link love comes a little late in the day. K’s birthday was this week. We had a slumber party last night and family party today. Needless to say, mama is a little tired. Worth it, thought – a fun time was had by all. With a 7 year old boy in the house, this is required. The egg is probably even optional. Here is a wonderful guide for making a household inventory. Man, do we need to get on that. Here is some surprising information. Do you know how many fruits and veggies I have thrown out tha, apparently, would have been fine to eat?!?!?!? St. Patrick’s Day is coming – YAY! (Yes, I am part Irish, can ya tell?) Here are some good food ideas. Here is a beautiful post. My dad died 8 years ago – I have pictures of us hanging in my house, too. Yum… dessert sushi. A Japanese – Italian fusion. Works for me. Must try. Here is a great guide for using your library. I do this… alot. It keeps my book addiction from getting too expensive. Love inter-library loans. Have a wonderful rest-of-your-weekend, everyone! Here is an early link love. On The Simple Woman, Peggy is doing a giveaway to help with spring cleaning. Just in time, too. With all the sun that is now shining in our windows, I can see how much I need to spruce up! I love Mrs. Meyers cleaning products – non-toxic, and then the house doesn’t smell like chemicals the rest of the day! I’ve always been a dog person. My mom is allergic to cats, so we never had one growing up. We did have dogs, though – wonderful, incredible dogs. I couldn’t imagine not having dogs in the family. When Hubby and I were first married, we bought a condo. I didn’t want to get a dog yet, since we both worked and had no real yard. Hubby had grown up with cats, and suggested we get a kitten. I had never considered having a cat, because I had always been a dog person. Off we went to the humane society, and, faster than you can say “Kitty!! !”, our family had grown. We brought Mocha home, and I learned about cats. 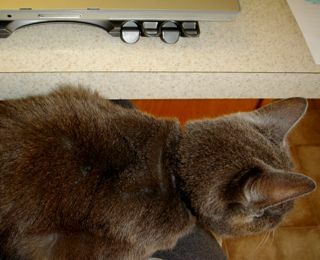 Mocha (who is still with us today) was, and is, what I consider a “typical” cat. He pretty much keeps to himself, only really making his presence known, quite vocally, when it is time to eat (don’t ask me how animals can tell time, but they can). Now, 14 years later, we have 2 kids, 2 dogs, 2 cats, a rat, and a pond full of fish. Through all the animals, I still would say I am a dog person. I’m starting to change my mind, though. Hubby was working on Sunday, grinding down some metal brackets for mounting some computers (isn’t that what everyone does on Sunday after church, in their church clothes?). At one point, I went out and asked if he was going to put on some goggles. He told me that he didn’t need to, because he was wearing his sunglasses (notice the foreshadowing?). On his way home from work yesterday, he called and said his eyes had been bugging him since about lunch. He was worried it was an infection, secondary to the lovely cold/flu/WHATEVER that we have all had. He had been in meetings all day and was concerned he had infected who knows how many people with his hand shakes. I called our ophthalmologist and got him in first thing this morning. This morning, our assumption was he would go to the doctor on his way to work. He called me after the appointment to tell me he was not on his way to work, that he was instead on his way to another doctor’s office – a corneal surgeon. It turns out he got metal fragments in both eyes Sunday. Our ophthalmologist was able to get one out, but the other one was embedded and needed to be surgically removed. Long story short, he is home with very sore eyes, starting on a 4 day course of antibiotics. Moral of the story – wear goggles. Please. One of the blogs I subscribe to is I’m an Organizing Junkie. 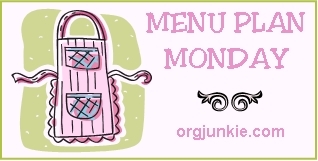 On her site, she does a post called Menu Plan Monday. Here is my first contribution! I started posting my weekly menu last Monday, but I wasn’t participating in her link. I’ve been reading her menu links for some time now. It really helps to see everyone’s menus – lots of ideas! Love it! Check it out here! Well, the menus for last week and this week have been affected by the refrigerator incident of 2008. We did not have the split pea soup last week (K was very upset – it’s one of her favorite meals). This week, are eating a lot of defrosted food. How would you like your chicken? We had the whole chicken roasted on Thursday. I will use the chicken breasts for Monday and Tuesday and I’ll do the thighs up in a teriyaki sauce for hubby’s lunches (I fix his lunches in a laptop lunch box, the kids’ too – LOVE them!). There are also 12 cups of homemade pasta sauce that we are using up this weekend and at this end of the week. 03.08.08 | Yay! It’s a party! Over at 5 minutes for mom, it is party time. They are hosting the ultimate blog party. It is a great way to find new blogs, so grab a cup of coffee, ignore the phone, head on over, and surf the day away! For those of you stopping by here for the first time, let me introduce myself. I was an RN a lifetime ago, but now I am a SAHM to two incredible kids (three, if you count hubby). I was born, raised, and am still living in southern CA. I have been reading blogs for awhile now, and just started my own. I would like to welcome you all here. Take a look around. There is not much yet, but I plan on posting 5 times a week on various topics, including books, food, crafts, and family happenings. I’m so glad you stopped by, and I hope to see a lot of you over at your blogs. Have a wonderful week at the party. Come back soon! 03.08.08 | Link Love Time! It’s the weekend – time for a little link love. I subscribe to…ahem…just a couple posts through Google Reader. Here are a few posts that caught my attention this week. K is turning 11 this week. I will have to do this. Now, I think it would be fun to bake up a whole mess of cakes and do a side by side comparison. However, if you don’t think your thighs can take it (like me! ), don’t worry. The work has been done for us. One of the blogs I subscribe to is Gather Little by Little. He now has 1,000 subscribers. Yay! Congratulations! Well, I was hoping for a quiet week, what with being all sinus-y and all, but life does not always go as planned. It was an exciting, eventful week, and I am now looking forward to a (hopefully) quieter weekEND. The kids will be at my mom’s, so I see a movie-fest for hubby and me in our immediate future. We have church events on Wednesday nights. The kids and I meet hubby there after work, and I bring his dinner. This Wednesday, when I went to put his dinner together, I noticed the freezer didn’t feel all that cold. Hmm…neither did the fridge. Consequently, the kids and I stayed home Wednesday night. I loaded up all our food to store in a friend’s fridge, and scheduled service for Thursday. Luckily, he was able to fix it and we did not need to buy a new fridge. Thursday was spent dealing with the repairs and then reloading all the food. If you are hungry, stop on by…chicken has been on sale recently. How many different ways can you fix chicken? Can you eat enough chicken so that the kids never want to see another piece of chicken in their lives? We will find out.